Logical thinking is the main part of programming. Maybe, depending on your job place you are going to use more algorithms or not. If you are a front-end developer you are probably going to deal with complex algorithms, and if you are a back-end developer may be a little more. If you are a programmer, then it is important to have good logical thinking skills. 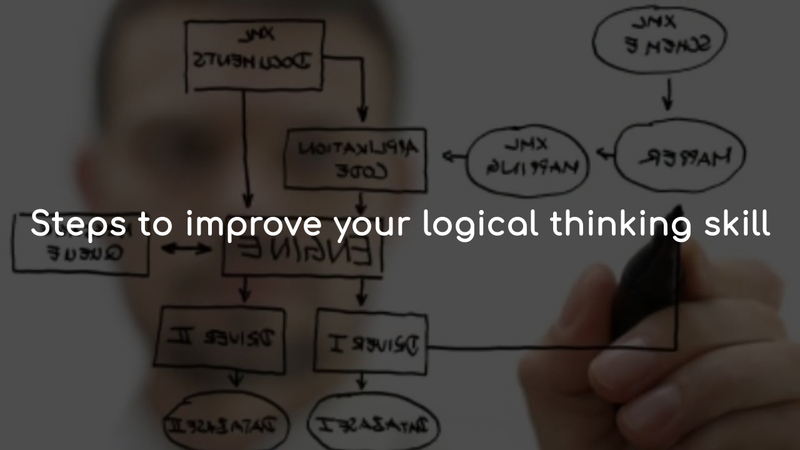 So, how could you improve your logical thinking skills? Let's find out. Programming is more about conditions and looping. To improve logical thinking, start to think conditionally such as Yes or No, True or False. Try to question yourself or solve a problem as a conditional statement such as if... then... it's very helpful to improve your conditional reasoning power. The machine didn't understand anything because it works on the instruction which we gave. To solve a problem, give instructions and try to follow the order. Here, instructions are nothing but logic. Machine-oriented thinking will help you to write logic in a program. Try to solve riddles and puzzles from newspapers or in a modern mobile app. Don’t get disheartened if you can't solve them at first attempt or take a long time to solve them. Remember that you are in the process of learning and improving skills. Your brain will be trained to think differently with every puzzle that you try to solve. You will find a much different code to solve a single problem on the Internet. Try to understand all the different logic in the programs. When you have understood why it was written that way, then try to improve that logic or implement that to solve different problems. Start by writing code in your favorite programming language for simple problems. Proceed with small and medium-size difficulties and then go tough complex ones. When you try to solve any problem, then try to understand it first, and analyze the possible solutions, short out the most basic elements of the problem and then start solving. This will help you to slowly improve your logic building skills. In the programming career, programmers face many complex problems in their day-to-day work. Try to visualize the complexity of the problem. Then break it into simpler modules or basic problems and solve it. It will improve your logic building thinking. A healthy lifestyle is very important for the proper functioning of the brain. Eat healthy food, take sound sleep and live a stress-free life, it will lead to better thinking and positive response in terms of logical thinking. A very good point is to learn programming paradigms. Probably one of the most programming paradigms is the Object-Oriented Paradigm (OOP). A programming paradigm is like a blueprint to follow to create our projects. You can learn Functional Programming to learn how you can develop programs and solve problems in a different way. Apart from reading a programming book, start reading books on analytical thinking, problem-solving, reasoning, aptitude, logic building, discrete mathematics, lateral thinking, combinatorics and also love. For achieving or improving logical thinking skills, practice in the key feature. So keep practicing your programming and logical thinking process, and most important update your skills.